Super Hero Boy: The Backyardigans Operation Elephant Drop on dvd! The Backyardigans Operation Elephant Drop on dvd! I always think of the Backyardigans as the show for over achieving rock star preschoolers. heh. Actually there is really nothing that this group of high energy friends can't do or won't try to tackle. Combine that with a pretty cool soundtrack and you have a win-win in my book. From Alternative Rock to Country Rock you won't be lulled to sleep by boring kid songs! Four episodes are included on the Operation Elephant Drop dvd with a running time of 93 minutes. From toxic space spills to geothermal disasters to just competing with their magical skateboard the Backyardigans are a pretty busy group! We especially love the The Flipper! episode. Pablo, Uniqua, and Tasha are on the Meteor Watch Squad when Pablo ends up spilling toxic space stuff all over himself. The toxic space stuff ends up transforming him into the super strong, very hyper, Flipper! Sometimes I wonder if Connor might have gotten into toxic waste stuff himself lately as the kid will not stop moving and he is convinced he can do anything any big kid can do only better. If you haven't see his youtube video where he is jumping off his dad's shoulders into our small pool you should check it out, seriously the kid is convinced he is a super hero! 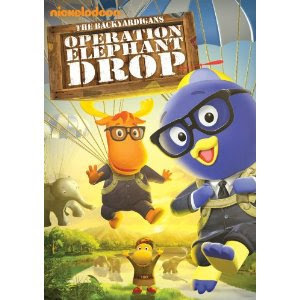 The Backyardigans Operation Elephant Drop is available right now on DVD and you can pick up your copy on Amazon ! Disclosure: We were given a copy of The Backyardigans Operation Elephant Drop free of charge, we were not compensated for this post in any other way. My opinions and comments on items we review are always my own and are never influenced by sponsors.